My boyfriend is dying. This is my story about living, loving and losing someone with terminal cancer. I genuinely don’t know how I’ve done it. It still feels as raw as it did on the day and, if it’s possible, I miss Jonny more each morning I wake up without him. I am completely uninterested in a life that doesn’t include Jonny Walker. Don’t worry, I’m not suicidal! If anything I want to live more than ever before; why would I take my own life when there are people like Jonny who don’t have a choice? There are people out there who are literally dying to be alive. No one should ever abuse the gift of existence; it’s a cliché but it’s never been more prevalent to live everyday like it’s you’re last. Especially for me; I’m going to travel the world. I’m going to work hard. I’m going to follow my dreams and jump into a career that brings me happiness. I’m going to take each and every opportunity that’s thrown at me no matter how scared I am. I’m going to climb mountains, walk the great wall of china, swim the channel. I’m going to live like each second of my life is a privilege and a blessing and a pleasure to be a part of. But I’d swap all of that to bring Jonny back. I would give my own life to have him here. I’d sign my soul away on the dotted line for Jonny to have a second chance. Not the memories, or the friendships formed out of this tragedy, or the fact I’ve ‘become a stronger person’. I would trade it all in to sit beside him and look at his beautiful face again for even a second. I can’t comprehend that he’s gone and I don’t believe it. If I think too much about the fact he is no longer of this world it blows my mind and it scares me so much I want to curl up and scream. There’s so much pain inside my head I’m scared it will destroy me. I’m having nightmares now. I can’t sleep. I can’t imagine a day where I don’t wake up crying. I can’t imagine a day where I don’t think about him. If anything it scares me; the thought that in the future everything will become so normal that Jonny only flutters through my mind every now and again. What I do know is you never get over something, you just learn to live with it. The grief will never go away, it’ll just become so second nature that I’ll have no choice but to cope with it. It won’t get smaller in my mind, it’ll just become cluttered with bigger, happier things. But even with all that said… It’s only been a week and I just bloody miss him…. 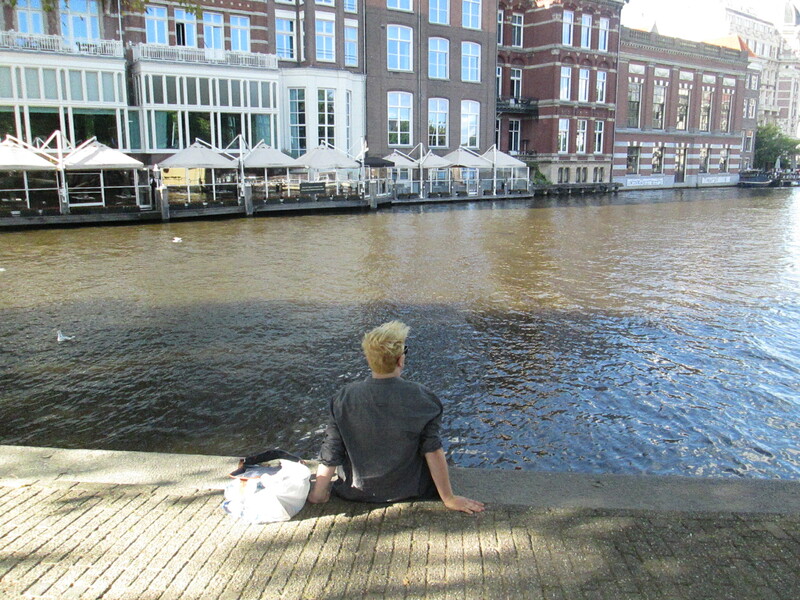 Jonny dangling his legs over a canal in central Amsterdam, 2014; his bucket list holiday. In this post from the blog Team Jonny, it’s been a week since Jonny died and Jonny’s girlfriend (JGF) writes about her grief. I highly recommend this blog to everyone, especially to those who may be experiencing grief. She’s written several entries after Jonny’s death and she is an open book expressing her raw emotions and feelings. I think most people don’t know how their supposed to feel after the passing of a loved one, however, I think learning about the feelings of others in the same situation can help them through the process. By reblogging her entry I hope this will touch and help at least one person who is grieving. Thank you JGF for continuing to share such an intimate piece of your life with us.